Parkour and freerunning for over 6 years. i do it because its stimulating. I have never felt more alive than when overcoming my "challenges" with only my body and mind. So many things i have looked at, thinking i have hit my limit. then i would come back to see i can pass that and keep going. I do it because i feel so accomplished when i do a new movement, jump a new distance, learn a new technique. I also have never found more fun than just having complete control over my own body. "Jump from here, flip in this way, land there, on that leg, and so on"
Every new trick is like a new super power, and we can hone them and combine them together and strengthen them just by wanting to and taking the time to get better. Thats what's badass. You mean I can't declare my altruism at your expense? Watch this, if you haven't seen it already. And pay specific attention to what he says around 2:04. The more you invest in any art form or sport, the more you will see it (or at least certain aspects of it) relate to other things in your life. I'm not saying that it is important to develop your own philosophy and reasoning for your movement (as he says earlier, the monkey would reply simply by saying 'why are you NOT moving? '), but I am saying that there are plenty of mental lessons to also be learned from this discipline. It is simply up to you whether you choose to open your mind up to them or not. The choice is yours, and nobody here has the right to judge you based on your personal ideas. Since everyone is different, we all have different experiences. A lot of people see parkour as something fun to do and do not delve in the the "deeper" side of things. Other people see it as the complete opposite. Personally, I see it as a little of both, for there is always time for play and seriousness. Some people parkour when they dont think its fun but rather for philosophy? Ugh. I was skeptical when everyone kept explaining about the philosophy behind this art of movement. I thought I would somehow find it....but I never saw it. 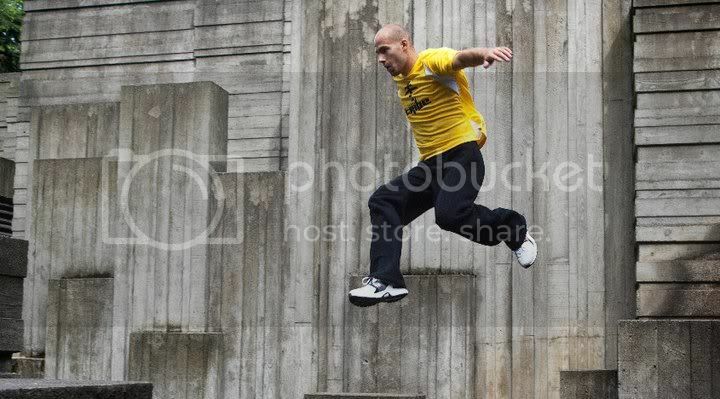 I greatly respect parkour, not like other adrenal-junkie activities. I see it more as a great way to stay in shape, be different, and have fun doing it. But due to my training I WOULD consider it a discipline, with constant challenges in the way and consistent training. but to each his own. Not to be rude, Cody, but why does this thread exist? People aren't going to change their view of parkour simply because you're irritated by something that shouldn't be a big deal. If it bugs you; ignore it. That's in interesting philosophy you've developed. I think he just wanted to get other's peoples opinions on the point that he has. This is just a little heart to heart I'd like to have with you guys. There's no need to get upset about a thread, if you don't like it, just ignore it! Hey if you want to get less out of your experiences thats your deal. Andrew don't treat him that way. If thats what he wants, cool. We all should be able to do parkour for the reasons we want to do it, without feeling like we are less than others (or make others fell like they are less). Cody, do it for the reasons you want to man. If you enjoy parkour for where your at in it, then thats awesome. Remember, we can't please everyone. Just because others say things about how they are getting more out of it than you doesn't mean you have to listen. That was a little uncalled for don't you think? Honestly I'm tired of hearing that because you associate a lifestyle with the disicpline that you are somehow superior to those who don't. I wish I could like threads. I meant that some people train very seriously as compared to people who have "more" fun. For example: Guys from PK Gen. train in nice and structured manners whereas others, like Dante Grazioli, train in a less organized manner. I'm not sure if this is making any sense, but I hope my point got across. I understand everyones viewpoints and I respect them for having them. Travis I guess you're right in saying that my philosophy is fun. And I'm saying I'm "right" with Parkour being about fun, no one is truly "right". I created this thread to get the word out that I'm tired of hearing that my experiences are less than those with their "all knowing" minds. I'm by no means saying I take no lessons from Parkour, but I don't focus on lesson learning as a main focal point of my training. Actually, PKGen isn't always structured. Sure, they have some of the most intense and physically demanding training sessions when they want to (I know this because I've been through them), but at the same time, they can still play. They just choose not to call their 'playing' training. When they want to train, they push their bodies to the limit, physically and mentally, for about an hour or so, and then rest. Trust me, goofing off with the guys from UK were some of the funniest memories I have. They know how to have fun, but they also know that when they want to buckle down and be truly productive and hard working, they have some of the best methods of doing so. Also, I acknowledge your last statement, and I wasn't taking offense to what you said, merely trying to clarify a point that I believe that you were making (that PKGen train seriously and Dante trains in a less serious way, exclusively). I personally play the soccer season because my friends are on it. I enjoy being with those guys, feeling some sort of "place" when playing the game. I don't get any serious mental thought out of it, (other than how it's comparable to war. People need to relax and enjoy the game, not act like it's the end of the world. /rant) however I do from parkour. "Your passion could be anything, it could be... music, art, it could be dance, it could be sport, it could be reading, it could be writing. But, when you have a passion, and its something that you really love, it drives you deep, and makes you think more, makes you think why you do what you do, and that's something that is very important to having a full life." Watch that and tell me what you think man. Best of luck with finding what you need. I don't think it was uncalled for at all. It is an honest statement. For many of us, parkour not only brings a physical aspect, but also a mental healing. It sure as hell has changed me for the better, physically and mentally.